Explanation: The Moon was new on July 16. Its familiar nearside facing the surface of planet Earth was in shadow. 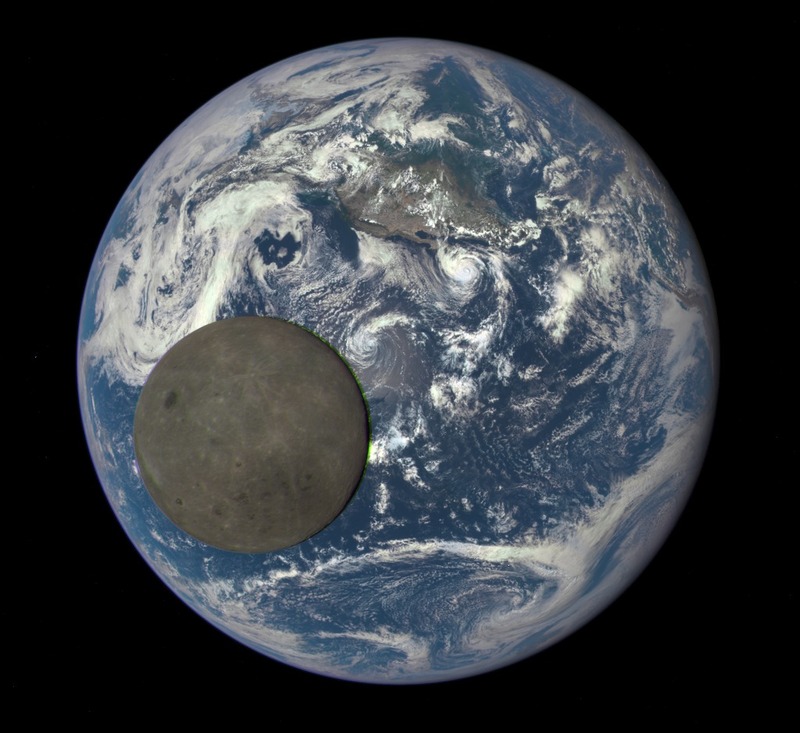 But on that date a million miles away, the Deep Space Climate Observatory (DSCOVR) spacecraft's Earth Polychromatic Imaging Camera (EPIC) captured this view of an apparently Full Moon crossing in front of a Full Earth. In fact, seen from the spacecraft's position beyond the Moon's orbit and between Earth and Sun, the fully illuminated lunar hemisphere is the less familiar farside. Only known since the dawn of the space age, the farside is mostly devoid of dark lunar maria that sprawl across the Moon's perpetual Earth-facing hemisphere. Only the small dark spot of the farside's Mare Moscoviense (Sea of Moscow) is clear, at the upper left. Planet Earth's north pole is near 11 o'clock, with the North America visited by Hurricane Dolores near center. Slight color shifts are visible around the lunar edge, an artifact of the Moon's motion through the field caused by combining the camera's separate exposures taken in quick succession through different color filters. 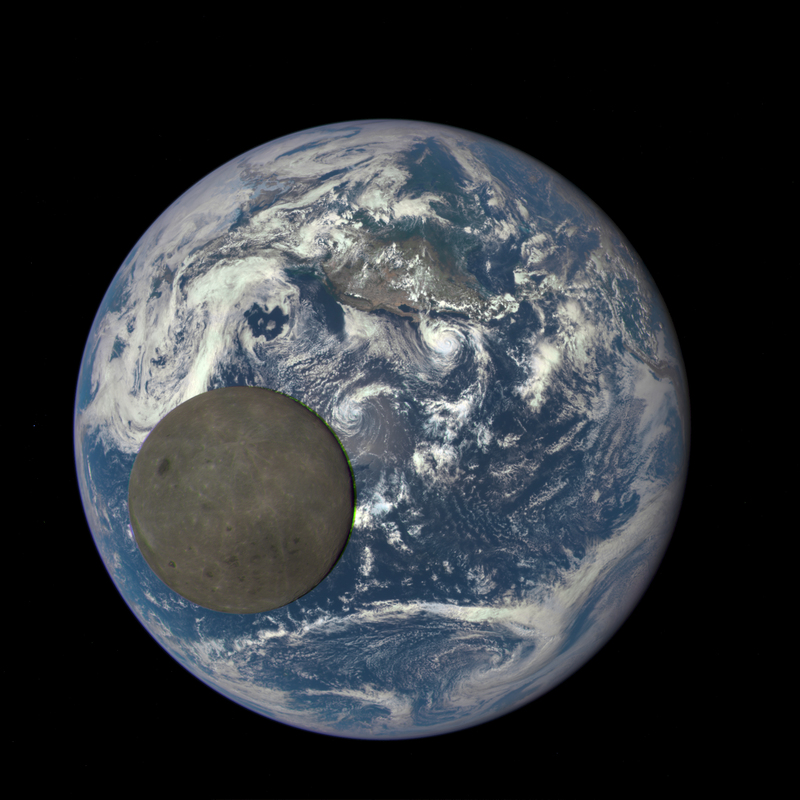 While monitoring the Earth and solar wind for space weather forcasts, about twice a year DSCOVR can capture similar images of Moon and Earth together as it crosses the orbital plane of the Moon.